This super easy project needs minimal quilting skills! 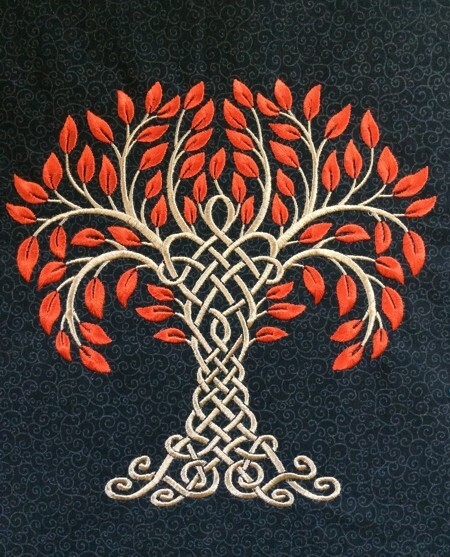 We used the design Celtic Tree of Life III for the commercial size hoop (8" x 12"). The design is also available for the large (5" x 7"), and mega (6" x 10") hoop. You can use any size. The finished size of the quilt is about 17" x 21". 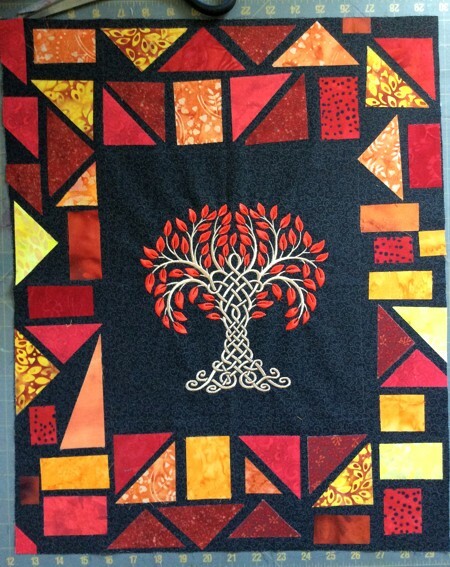 You can purchase this wall quilt from our Etsy store! Stabilize the center of the black piece of fabric with medium-weight iron-on cut-away stabilizer. Hoop it tightly. Choose threads. The first color of the design is for the leaves, the second one is for the tree trunk. 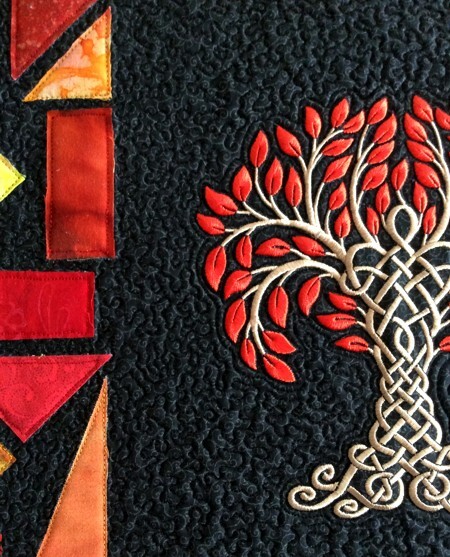 Upload the embroidery file of the Celtic Tree into the machine and embroider it. After the embroidery is done, press the stitch-out and the fabric around it. 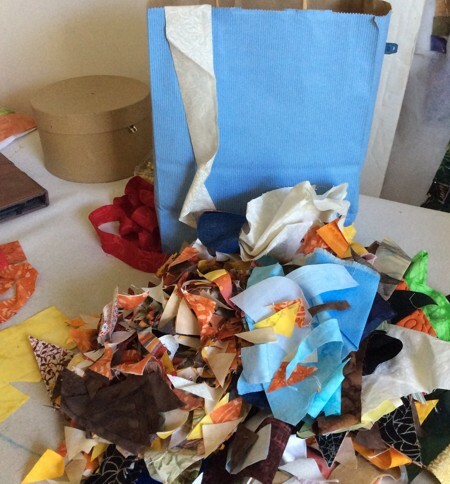 In my workshop, I keep a bag full of scraps that are usually too small to be useful. This time, they came in handy! 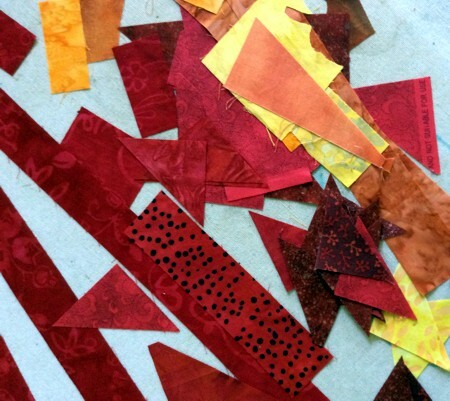 Since my stitch-out is in red and beige, I selected red, orange, yellow and brown scraps to match the colors of the embroidery. I selected triangles, squares and rectangles of different sizes. Arrange the scraps around the stitch-out. Feel free to play around until you have an arrangement you like. When you are satisfied with the layout, take the fusible web and use it to attach the shapes to the base fabric one by one. 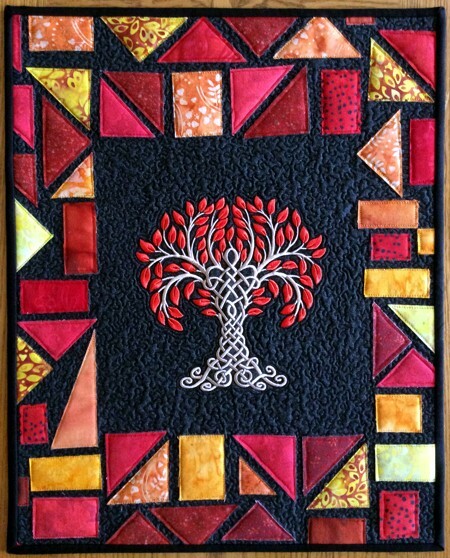 This is much faster than piecing, and works great for an art quilt like this one! Following the manufacturer's instructions, press the shapes with hot iron to adhere them to the base fabric. Pin all layers together with 1" pins and start quilting. We quilted with a free motion stippling pattern around the embroidery and all the black parts. Then we quilted along the edges of our fabric shapes.